The Q4-2017 updates have just been published and they include some exciting stuff on the Reporting front for SAP SuccessFactors customers. Below are my top 3 favorite advancements in-the-works. To date, the focus has been on the launch of the Report Center, specifically making a more user friendly unified front end for accessing all reporting in SAP SuccessFactors. So far approx. 2,500 instances have commenced using the Report Center. The next step planned in the Roadmap is to unify the back-end processes that drive the Report Center which starts with unifying the data layer leveraging HANA. So regardless of where you get the data, it’s the same experience allowing you to include data from virtually all SuccessFactors sources into a single query including Learning. This will be part of something brand new called the Unified Reporting Solution planned for production by end of 2018 (accessible via the Report Center). This solution which is currently targeting a closed beta launch by Q2 will eventually replace all other tools ORD, Ad Hoc, BIRT, Tiles etc. Current advice for customers “Continue to use existing tools until this happens. We will initially allow access to old reports but will then begin a phased sunset approach of the old technologies”. The Unified Reporting Solution requires that the instance be moved onto SAP HANA . There is something exciting for new Employee Central customers, a beta solution called Analytics in EC. This solution delivers reports for Day 1 of Go Live including out-of-the-box reports for EC based on best business practice design. These reports will be embedded in both the SuccessFactors Homepage and the Insights Panel as well leveraging super-fast HANA OLAP technology. Please note that customization of these reports is not available, if a customer wants to customize a report they need to move to WFA. And finally, my third favorite exciting advancement in the SAP SuccessFactors Q4 2017 reporting update is that SAP Analytics Cloud (SAC) now includes a connector supporting WFA. 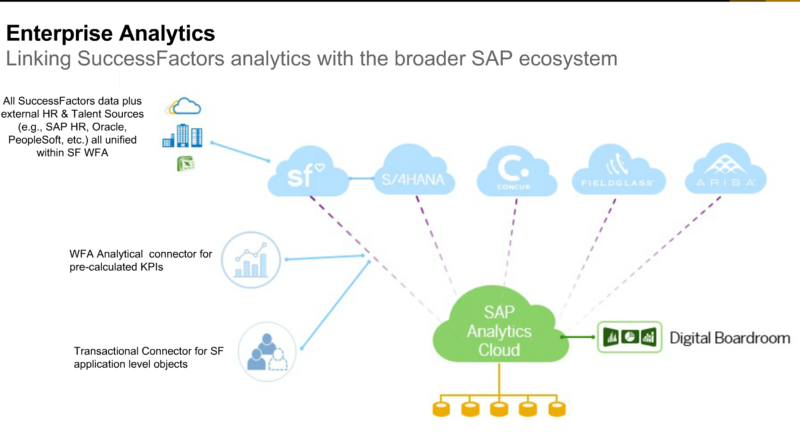 This connector allows users to import data from WFA for analysis and inclusion within SAC models and stories (stories form the basis of SAP Digital Boardroom presentations). This is the first time that WFA data has been made available externally to the SFSF HCM application which allows customers to present WFA data together with data from other SAP SFSF applications. This blog is cross-posted from: http://www.epiuselabs.com/lets-talk-hcm/top3reporting.